We are continually looking to enhance both the effectiveness and efficiency of our ‘virtual barrier’ at Bottle Rock Peninsula. The TUN200 trap box is our most effective tool for rats. Our usual spacing between traps along each of our virtual barrier defence lines is 10 metres. 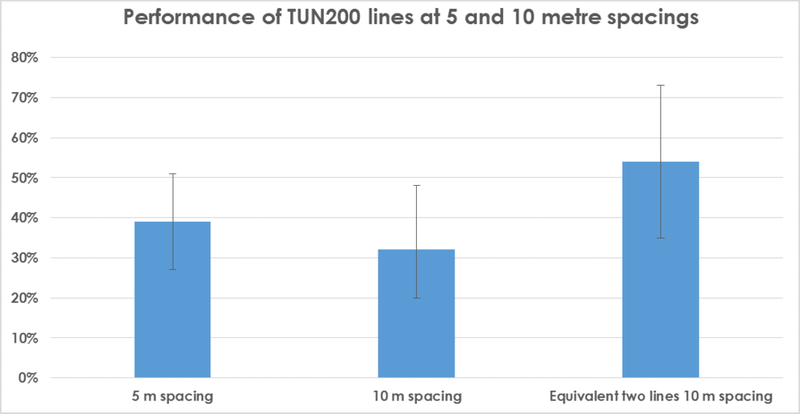 Between September 2015 and February 2016, we ran a trial to assess whether TUN200s could be placed at 20 metre intervals along the first defence line in the virtual barrier (D1), without significantly impacting the performance of the barrier as a whole. 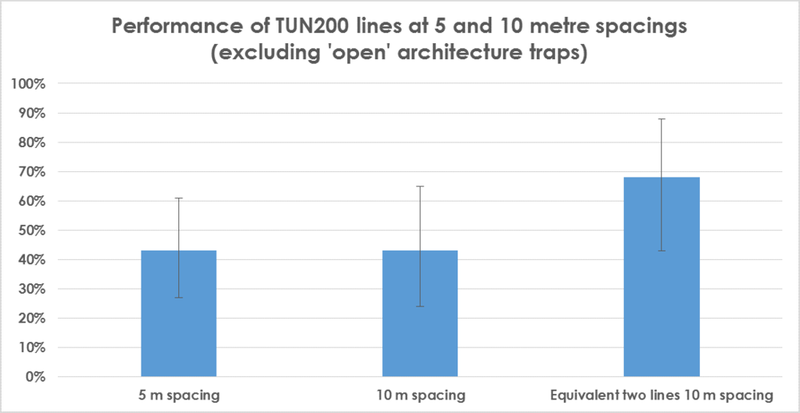 We found strong evidence that a 10 metre spaced line is more effective than a 20 metre spaced one. In this context effectiveness means the fraction of rats coming at a line that are trapped as they attempt to pass through the barrier. In fact there was no evidence to suggest that there would be any difference in effectiveness between a 10 metre-spaced line and two 20 metre-spaced lines (i.e., the same number of traps in a different configuration). This indicates that 10 metre spacing of traps is unlikely to be so close that individual trap catch rates are diminished. This led to the hypothesis that further decreasing the spacing on D1 from 10 metres to 5 metres might result in additional gains in effectiveness. The effectiveness of a 10 metre-spaced line is approximately 35%. Would the effectiveness of a 5 metre-spaced line be similar to two 10 metre-spaced lines, or closer to just one? The numbers are not sufficient to be definitive, but there is no evidence that a 5 metre-spaced line is any more effective than a 10 metre-spaced one (p-value 0.45). It seems less likely that one 5 metre-spaced line is as good as two 10 metre-spaced ones (p-value 0.12). There appears to be very little difference between the effectiveness of the 5 metre- and 10 metre-spaced lines.